The Basics: Gravity and Air demonstrates the properties of gravity and air with a barometer that slides from floor to ceiling and an 11-foot, radio-controlled blimp overhead. Winging It uses a series of wind tunnels to demonstrate the forces of lift that lift an aircraft off the ground. "Explainers" are on hand to perform demonstrations. Faster Than Sound: High-Speed Flight demonstrates how aircraft fly faster than the speed of sound through the use of a supersonic wind tunnel. Getting Aloft: Thrust explores propellers, jets, and rockets that provide thrust, the forward motion needed to sustain lift and counter drag. Gravity and No Air: Flight in Space uses computer interactives and a "gravity well" to demonstrate how a spacecraft in orbit is affected by gravity. Staying Aloft: Stability and Control explains "attitude" (orientation) using a rotating platform, a model Cessna 150 in an airstream, and a real Cessna 150 with operable rudder, ailerons, and elevator. The Makings of a Flying Machine: Structure and Materials explains how materials and structure shape the way air and space craft look and perform, explores the advantages and disadvantages of different materials used, and includes a cut-away Cessna 150. An amphitheater-style area features "Explainers" performing demonstrations. "Forces of Flight" demonstrations, paper airplane contests, "Air and Space Touchables" demonstrations, and videos rotate throughout the day. 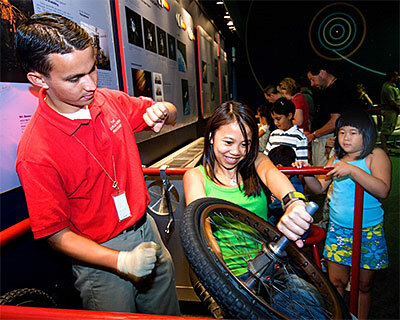 A Visitor Resource Center is filled with science activities, video programs, interactive computer programs, children's literature, and other reference materials related to flight sciences.